Meta tags are invisible tags that provide data about your page’s content to search engines and website visitors. Meta tags are placed in the <head> section of a HTML document, and are coded in your CMS. Meta tags offer more details about your site to search engines and website visitors who encounter your site in the SERP. Optimizing meta tags will make your website stand out in search results. 1. Title tag – Pay attention to your title tags, be clear and descriptive. The title tag is the title of your page. Hopefully it tells the searcher what your content is about. It’s important to the SERP and it will show up as anchor text and title in social shares. Make your title tag clear, descriptive and less than 55 characters. Adding keywords into the title will enhance SEO but ONLY IF it adds value and doesn’t interrupt the meaning or message of the title. Blend clarity with context and make sure your title makes sense to everyone. If you’re using a plugin like Yoast SEO in WordPress, allows you to add your title tag in the SEO section and see a preview of how your page will look in search page results. 2. Meta description – Use your meta description wisely and take advantage of the opportunity to provide more details about your content. Make it appealing, concise and relevant. The meta description is of equal importance to the title tag. 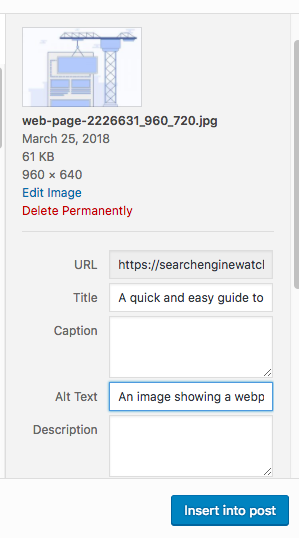 If the title tag is the title that appears at the top of a search result, the meta description is the snippet that displays underneath. The meta description should provide an accurate description of the content of your page. It is usually the element that determines whether users will click on your page, which makes it important to spend time on its optimization. Previously, the optimum length for meta descriptions was 150-165 characters, but a recent update to the way Google displays search results has resulted in longer snippets being shown on occasion. For more on what this means for SEO and how to adapt, have a read of David Portney’s comprehensive piece, ‘Google’s updated SERP snippet length: What should be your SEO strategy now? 3. Robots meta tag – Manage the pages that search engine crawlers access on your site by guiding them through the robots meta tag. Use the robots meta tag to ensure that search crawlers process each page the way you want them to. The robots meta tag informs search engines which pages on your site should be indexed. This meta tag serves a similar purpose to robots.txt; it is generally used to prevent a search engine from indexing individual pages, while robots.txt will prevent it from indexing a whole site or section of a site. If you don’t add a robots meta tag, the default for crawlers is to index and follow your page. When to use this meta tag; It might be that you have some pages on your site which are necessary, but quite thin content-wise. You don’t necessarily want them to be indexed in search, but they’re still important to the site, so you can use a noindex tag to prevent them from appearing in the SERPs. Google also requires links to be nofollowed under certain circumstances. For example, in 2016, it issued a directive to bloggers to nofollow any links that they included as part of a product review, as “these links don’t come about organically”. If you want to nofollow an individual link, you can achieve this by adding rel=”nofollow” to the link HTML. However, if you wanted to simply nofollow all links on a particular page, you can achieve this with the robots meta tag. 4. Alt text –Use alt text in your images to describe your visual content. This is a great opportunity to improve your SEO while helping both search engines and people to learn more about your images. Image optimization offers an additional opportunity to rank in the search results with your visual content. Your images should be accessible to both search engines and people. Alt text can ensure both of these things: it provides a text alternative to images which will be displayed if the image doesn’t load, or will be read out by a screenreader; it also tells search engines what that image is meant to represent. You can include keywords in your image alt text, but only if it makes sense to do so – don’t keyword-stuff this tag, as it will only end up harming the user experience for your visitors with accessibility needs. 5. Canonical tag – Use canonical tags to avoid having problems with duplicate content that may affect your rankings. If you have pages on your site that are almost identical, then you may need to inform search engines which one to prioritize. Or you might have syndicated content on your site which was republished elsewhere. You can do both of these things without incurring a duplicate content penalty – as long as you use a canonical tag. Instead of confusing Google and missing your ranking on the SERPs, you are guiding the crawlers as to which URL counts as the “main” one. This places the emphasis on the right URL and prevents the others from cannibalizing your SEO. 6. Header tag (h1, h2, h3, etc.) – Use header tags to help search engines understand your main topic on each page. Use them wisely and find a balance between the reading experience and the SEO value. Header tags improve user experience by making content easier to read (headlines, subheadlines, subheads, etc.) and they tell search engines what your content is about. The order of your header tags –from h1, which is typically your headline or article title, to h6 which is ranked just higher than paragraph text– tells readers and search engines the importance ranking of each section. Structure them like you would structure an outline in a word document using heirarchy from main point down to lower points. BUT –Less is more here. Use them when they break up the page for the reader showing when new main points are introduced. Adding all 6 levels won’t improve your SEO unless it also improves the reader’s experience. It’s usually suggested to use only one h1, while you can use more than one h2 or h3. Create a checklist of the steps that you need to repeat when you create new content, and turn meta tags into a part of your routine. Targeted keyphrases are proximate to each other.For example if your keyword was ‘auto parts’ and this your sentence was ‘find auto parts in our Los Angeles stores’ the phrase ‘Los Angeles stores’ would become part of the secondary keyword phrase. After you have completed these 15 items for all website pages the next task is off page search engine optimization, which is defined as acquiring backlinks or simply getting people to link to you.